Men must wear two pieces of white, unsewn, plain cloth as part of the Ihram – an Izar (waist-wrapper) and a Rida (covering for the upper body, like a shawl). It is also recommended that you take an additional set in case your main Ihram garments become impure. 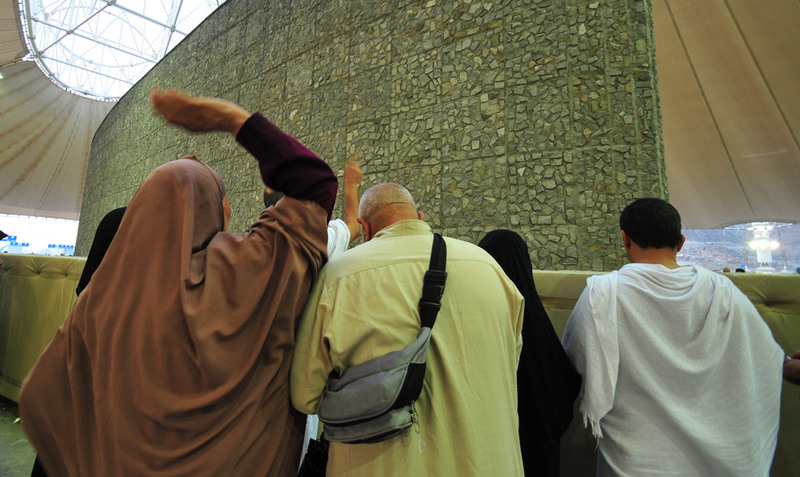 Remember, if you’re performing Hajj, you will be in the state of Ihram for three days and two nights. Your Ihram can also be used as towels or blankets at a later stage. For women, there is no specific garment that must be worn in the state of Ihram. Your dress should be plain, inconspicuous and not for the purpose of beautification. Saudi Arabia has a very hot climate so avoid taking very thick articles of clothing with you. The considerable physical exertion of the pilgrimage and the inevitable perspiration that comes with it will feel somewhat uncomfortable, so it’s a good idea to take comfortable, loose-fitting cotton garments for everyday wear. You don’t need to take a huge amount of clothing with you. In the hot Saudi Arabian climate one set of clothes usually lasts one day so keep this in mind when you’re packing. Take clothes that require little to no ironing, are easily washed and are appropriate for the journey. If you are travelling during the winter months, from November to February, you may want to pack a light sweater or jacket to wear in Madinah, which tends to be fairly cool during the night and the early part of the day. For men, the Saudi Thobe / Jubbah and the Indo-Pak Shalwar Qameez are ideal pieces of clothing for everyday wear. Thobes / Jubbahs are available for purchase throughout Saudi Arabia. It’s made from a fabric which does not stick to the body nor does it reveal the body’s figure. It’s sufficiently thick and long so as to not reveal the body. No attractive scent emerges from it. Women must also wear a headscarf (Hijab). Soft, airy, light cotton headscarves are the best option for everyday use. Many pilgrims often suffer with problems with their feet and ankles as a result of inadequate footwear. It is therefore vital you choose the correct footwear in order to prevent blisters, swelling and unnecessary pain. As a general rule of thumb, you should avoid buying brand new footwear for your Hajj or Umrah. A new pair of shoes require breaking in which can take a fair amount of time as they slowly loosen and soften with use. You should therefore wear a comfortable pair of shoes that you regularly use and doesn’t cause you any pain. If you don’t have suitable footwear for your journey, purchase a pair weeks in advance and break them in by wearing them around the house or exercising in them. If you’re male, your ankles, heel and instep will also need to remain exposed while you’re in the state of Ihram. A flat, soft pair of sandals is therefore ideal to not only wear but also to carry with you and store in your bag when you’re in the mosque. If you don’t own a pair of sandals, purchase a suitable pair well in advance and break them in sufficiently. Women may wear any type of footwear. Note: the instep area i.e. the top part of the foot remaining exposed is a condition of Ihram according to the Hanafi school of thought. The other schools stipulate that only the ankle must be exposed while in Ihram. You should also take a pair of trainers / sneakers which you can wear when you’re not in the state of Ihram. Trainers are ideal for walking and performing certain rites of Hajj such as Rami because they provide grip and are generally comfortable. You should however avoid wearing this type of footwear in the Haramain as it may be quite difficult carrying them around. Laundry services may be available as part of your Hajj or Umrah package so this is something that you’ll want to query with your travel agent. If not, there are a number of professional laundry facilities available in Makkah and Madinah although these laundry facilities can be quite expensive, particularly during the Hajj season as prices increase. If you plan to do your own washing, washing powder and washing soap is available in supermarkets. * Must be fragrance-free while in the state of Ihram.